This FD3S Mazda RX-7 really doesn’t need much of an introduction – it’s one of many cars over here in Japan that I’ve had on my ‘to shoot’ list for far too long. But finally, after the stars recently aligned, I managed to get the cool guys at Car Shop Glow to bring their time attacking Mazda to a quiet location away from the hustle and bustle of Tokyo’s daily chaos. Like all the cars that participate in Battle Evome, it’s evolved over the years; aerodynamics maximising its performance all the way down to a 56-second lap best at Tsukuba Circuit. That, my friends, is very fast – especially considering that it’s not driven by a pro driver, but rather the man that runs Car Shop Glow, Yukimitsu Hara. And the most surprising thing of all is that Car Shop Glow can’t really be classed as a tuner, as its main business revolves around custom automotive LED solutions and light upgrades. 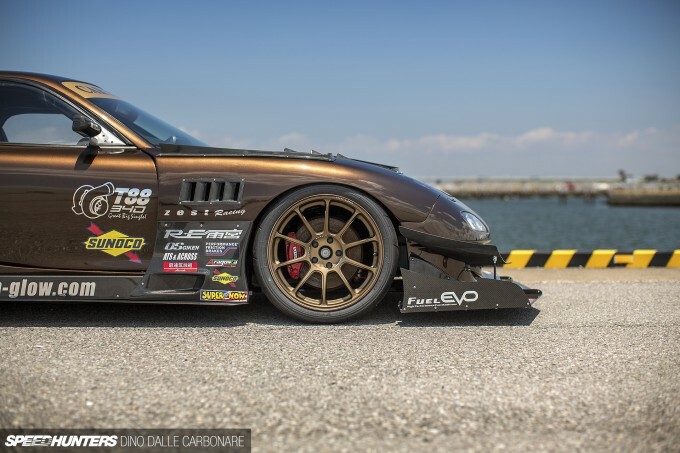 Hara-san, however, likes to race, and time attack is of special interest, leading him to transform this RX-7 – which was once his street car – into something that’s far more track focused than road friendly. The bronze FD3S may still be fitted with a navigation system, speakers and even an ETC machine for paying highway tolls in Japan, but the days of taking it out for a brisk Sunday drive are all but over. 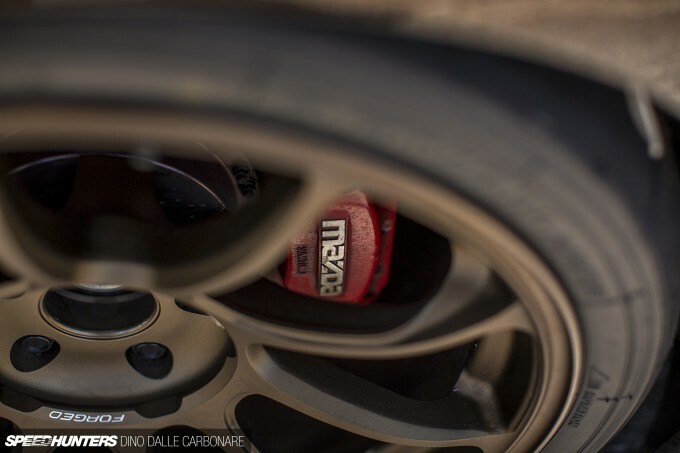 The Mazda sits low on a set of Aragosta dampers custom setup by Pisto Racing. Suspension links are rose-jointed and every bushing has been replaced with a polyurethane equivalent, or where possible solid mounted to the chassis. As I alluded to a moment ago, the way the RX-7 cuts through the air has been refined over the years with a host of upgrades that build on the already-impressive RE Amemiya AD GT widebody kit. Everything is beautifully and exquisitely executed; Car Shop Glow taking pride in the wet carbon parts they are able to create nowadays. But let’s take a closer look – firstly up front where the RE Amemiya bumper is easily recognisable thanks to that signature central air intake. Everything else, however, is masked by some serious looking aero additions. The big main splitter is capped at each end and joined by a pair of canards that are hinged in place with support bars to ensure that flexing is kept to a minimum. It couldn’t be a serious JDM time attacker if it didn’t trade its side mirrors for a pair of Craft Square carbon items, which will instantly change the profile of any car – as they do here. 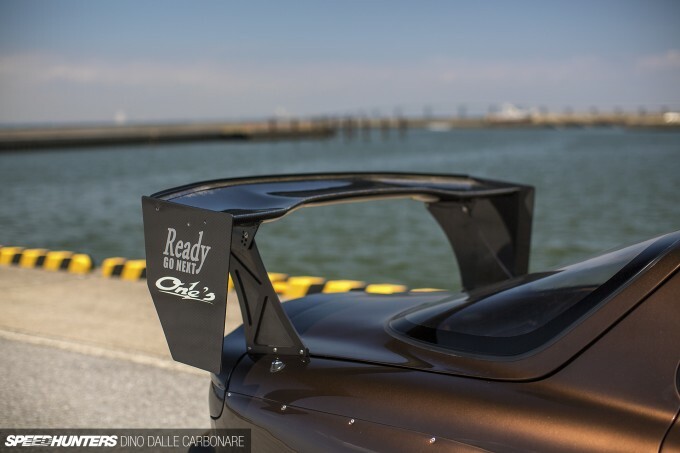 An RE Amemiya diffuser has been modified and joined by a pair of vortex generators, while a Car Shop Glow carbon wing graces the FD’s deck. It all combines to create a focused machine that oozes presence and requires time to fully take in. The more I looked at it, the more details and small touches I noticed. From this angle, for example, I was blown away at the amount of air outlets that have been worked into the front end. As Andrew Brilliant has always told me when attempting to explain some of the secrets of aerodynamics (which I can usually follow for about 30 seconds before zoning out), you have to dump as much air as you’re taking in, and do so as smoothly as possible while using it to your advantage. Or something like that anyway! The FD’s front end definitely channels air away from the engine bay as well as the wheel arches, which have recently been fitted with louvered side and top outlets in an attempt to find more front end downforce. The air that flows around the profile of the car also needs to be managed in a smart way, and here additional skirts do just that. 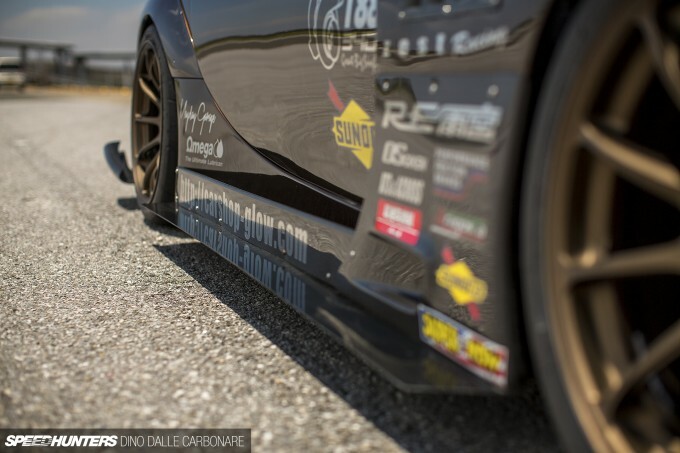 They meet at what is one of the most popular rear over-fender sections for the FD – it’s simple, but it adds so much effect to the overall stance of the car. The candy paint is something I have to elaborate on too – the base bronze hue is actually inspired by a Nissan Cube color, but there’s extra metallic flakes added to really make it pop. Finishing things off are RE Amemiya fixed-projector units in place of the original pop-up headlights and Car Shop Glow’s latest LED small light and indicator units. Then of course there are the wheels. Up until a while back the RX-7 used to run on one of my favourite wheels out there: the Volk Racing CE28N from RAYS. It’s now sitting on a set of ZE40s, which are not only stiffer but also quite a lot lighter too. Then we get to the brakes, and this is something that always makes me chuckle when it comes to RX-7s. 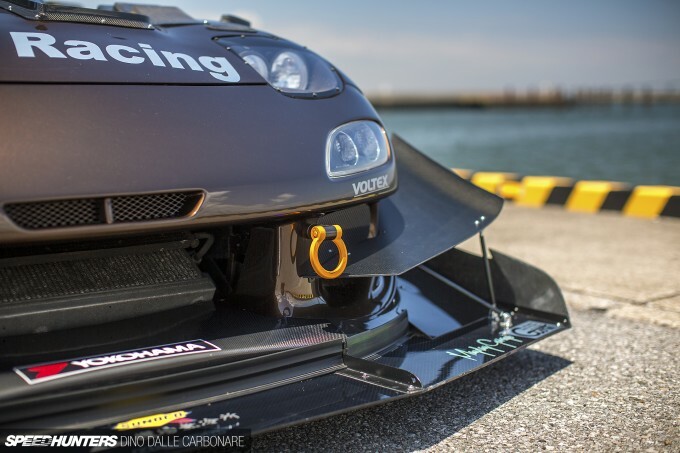 This is a 56-second car at Tsukuba – 56.4 second to be exact – yet it manages to achieve this time running stock brakes. Okay, so the front rotors are of a higher spec as they are off the shelf PFC items, as are the pads front and rear, but that tells you all you need to know about racing and tracking a lightweight car. 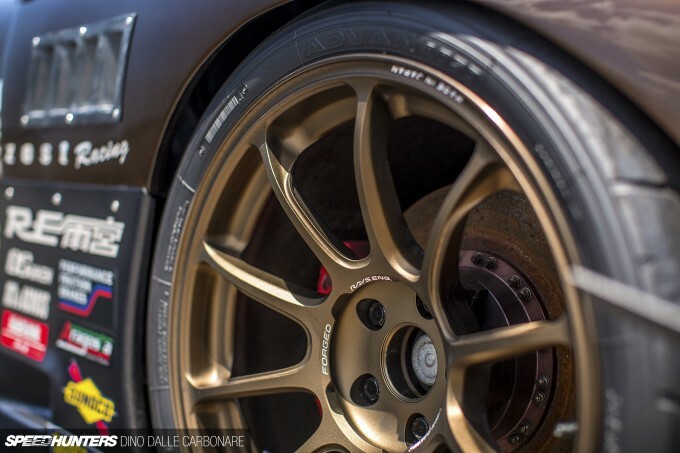 Good luck running sub 60-second lap times at Tsukuba in a GT-R with factory stoppers! Soaking in the details I also spotted what looked like another new addition to the back of the car: a moulded wet carbon trunk spoiler which wraps around the RX-7’s taillights. The lights contain custom Car Shop Glow LED inners, resulting in a unit which is gaining quite a lot of exposure thanks to social media. I’ve begged Car Shop Glow to create some cool LED solutions for us R32/R33/R34 GT-R folk, and we might be in luck as I’m told something’s already in the works. 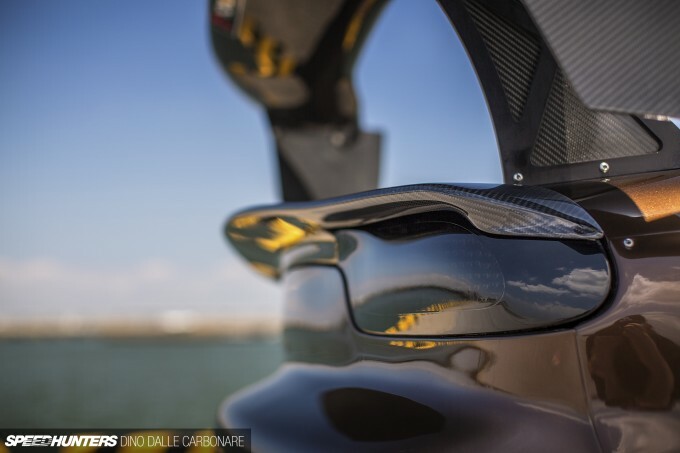 Here’s another angle of Car Shop Glow’s custom carbon fiber rear wing which features some large end plates. It sort of reminds me of the Do-Luck wing on the R34 GT-R – just an extended high-mount version of it. 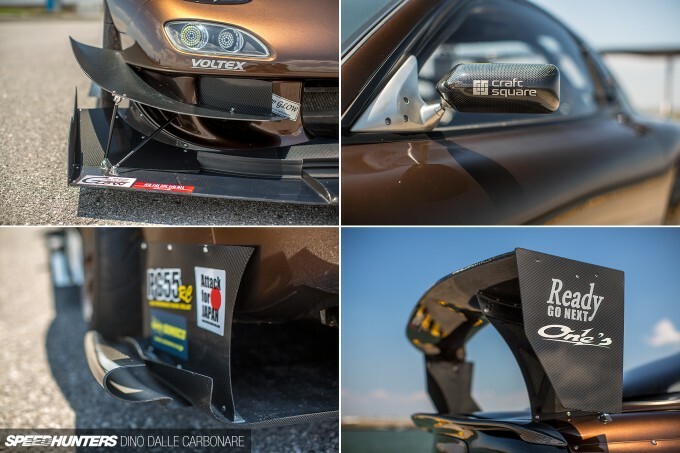 As you can see from this image of the RX-7 from the last time I saw it out at Tsukuba, the wing is a new addition and something they’re trialling to see if it makes an actual difference through the corners. 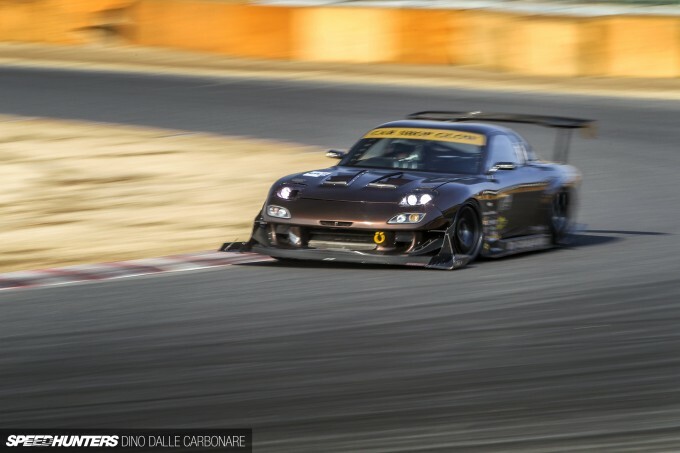 But the thing that makes this RX-7 the performer that it is, is what it’s running under the vented bonnet. An engine of this nature is definitely outside of Car Show Glow’s realm, which is why they collaborated with rotary specialist Zest Racing in Chiba. Zest have provided the sort of power and delivery that a car competing in time attack needs, so you won’t find a 3-rotor monstrosity developing four figure output, but rather a well-tuned 13B that ticks all the right boxes. The bridge-ported engine produces 530hp thanks in part to a giant Trust T88-34D turbocharger, but to not dull out the fast spooling and responsive nature that rotary engines are known for, Zest came up with a custom V-mount setup for the intercooler which keeps the pipework as short and as straight as possible. An HKS F-Con V PRO engine management system handles the fueling and ignition and is able to extract a usable torque curve which peaks at 6,900rpm with 490Nm. 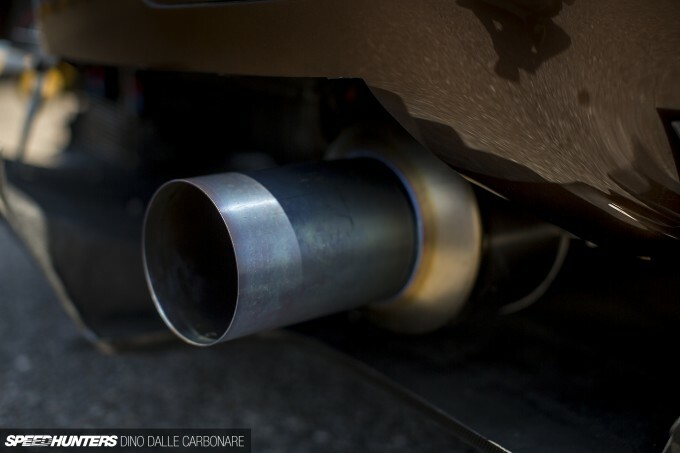 Zest also fabricated a straight-through titanium exhaust with an extra-long silencer to clear the bumper and diffuser. Opposite the exhaust outlet the airflow originating from under the car is put to good use running through a small but efficient transmission cooler. Hara-san will continue to perfect his FD with the immediate goal of breaking the 55-second barrier. That of course won’t be the end of it – it never is – as the love and attraction for time attack naturally makes you want to see how far you can push things. 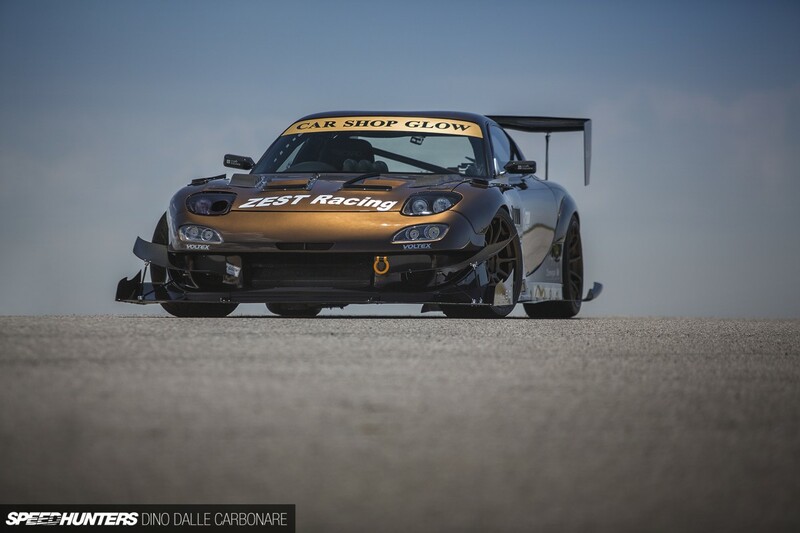 Like a lot of privately-run time attack cars, the Car Shop Glow FD competes in a number of events. Next season I’m planning to stop by an Attack meet, which is quickly becoming the series to participate in. By then there’s a good chance that Hara’s FD will be producing more power and torque, and will perhaps have a new transmission to replace the current HKS 6-speed dog box. No off-season goes by where the car isn’t enhanced or developed in some way. It’s the core of this discipline, and to see people and shops put together these sort of machines continues to be the most inspiring thing in the Japanese tuning scene. Unlike in other countries, time attack in Japan is still very small. Aside from what are essentially small track day events and magazine sessions organized by titles like Rev Speed and Option, there is nothing like a national series. That’s exactly why no big-name tuners or parts makers are involved anymore, which on one side of things is a bit sad and depressing, but on the other side keeps this sport at a grassroots level which helps make it all the more special. 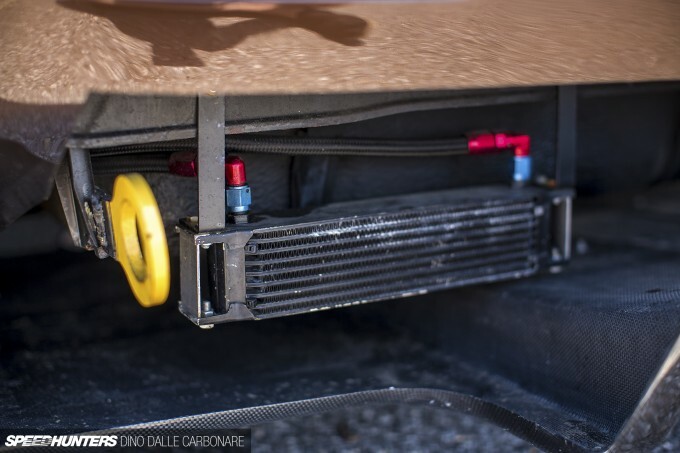 There are a couple of aspects of car building that Japanese tuners and builders lag behind in – one being engine management solutions, and the other interior and chassis prep. As far as the latter is concerned, the Car Shop Glow RX-7 is on another level, something that becomes obvious once you open the door. The metal outer shells remain, but the inner trims have been removed and replaced with lightweight carbon cards. There’s a custom cage which is welded to the chassis and boxed up and gusseted in various locations for added strength and rigidity. It really helps get the most out of the FD’s shell, which by modern standards is lacking in the stiffness side of things. 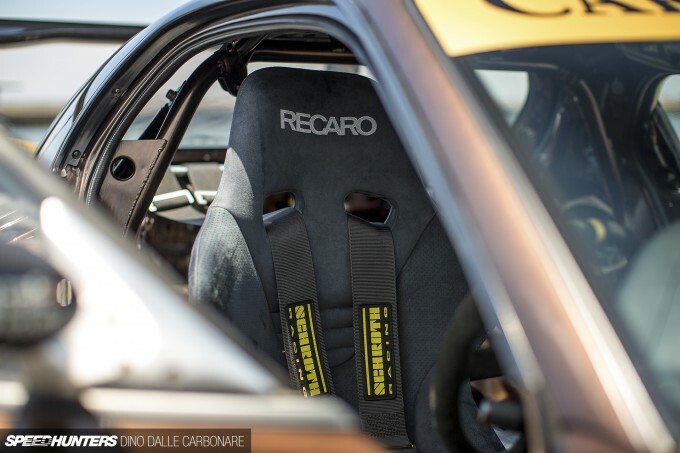 The cage extends rearwards behind the Recaro driver’s seat to join up to the rear strut towers. Only the main dash and center stack section remains; every bit of additional trim having been removed to expose bare metal. But in true JDM style there are a few electronic additions in the mix, including an HKS boost controller, HKS Circuit Attack Counter lap timer and three A’PEXi gauges. You can also see how the double-DIN navigation headunit has been left in place – something that’s pretty strange to see in a time attack car, but a reminder of what sort of machine this RX-7 once was. Car Shop Glow’s FD3S should serve as the perfect starter for some real rotary goodness we have coming for you. 7’s Day is upon us and we plan to hit up Daikoku and Umihotaru as usual, to give some love to the iconic Mazda model. While Mazda enjoys the limelight now that its new Roadster/Miata/MX-5 is hitting streets around the world, I hope it won’t forget about a very special group of diehard supporters – a rare breed that will probably never give up on their passion for the Wankel engine. No bonus images?!?! lol. Love this car & the color. And kudos to Hara-San for building a Baddass car to enjoy his hobby. Can't wait for the monthp of 7's!!! Oh my god! That is absolutely incredible. Hell of a build. What type of truck is that tow truck i want one. MAXIMUMatttack JDM transporter. Best in the world! Per a contact and fellow rotorhead in Okinawa, parts are starting to get scarce for the FD and even some of the OEM engine parts are now listed as NLA by Mazda. I am now in parts collection mode for the FD. Luckily my NA FC ( daily driven ) is a little bit easier to shop for here in Florida. Cant wait for more 7's day coverage. This was featured in Import Tuner a while back and a recently published PAS magazine, both said it was still regularly street driven with Hara even taking it on touge runs. If that's not the case any more I'd be a little sad. 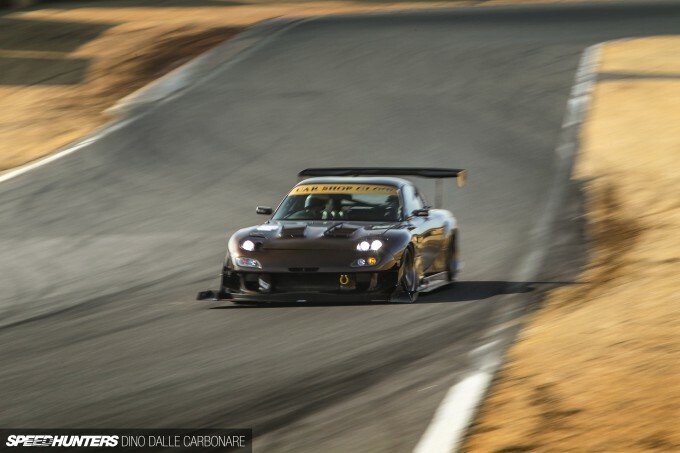 This FD was like a "budget" version of Glickenhaus's idea of a road going race car. 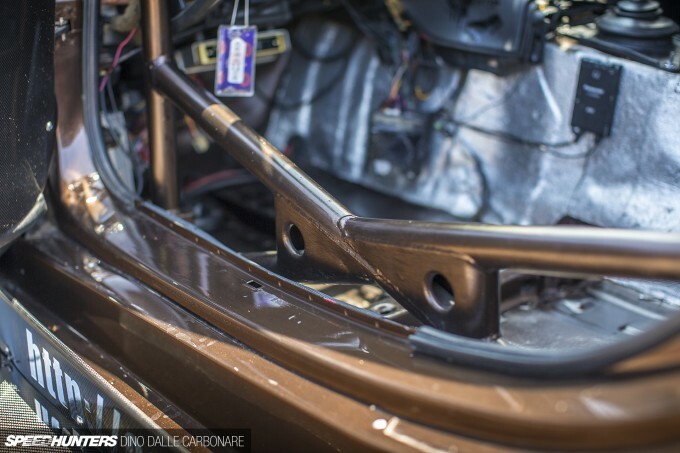 Glad to see we'll be getting some more RX7s on Speedhunters and even more so that it was led by this feature. Been a fan of this FD since I saw it in that Battle Evome coverage. 8:03 pmJuly 6, 2015 Nick. Aweeeeeee yeah, I like what we have here. Stock brakes! Wow! 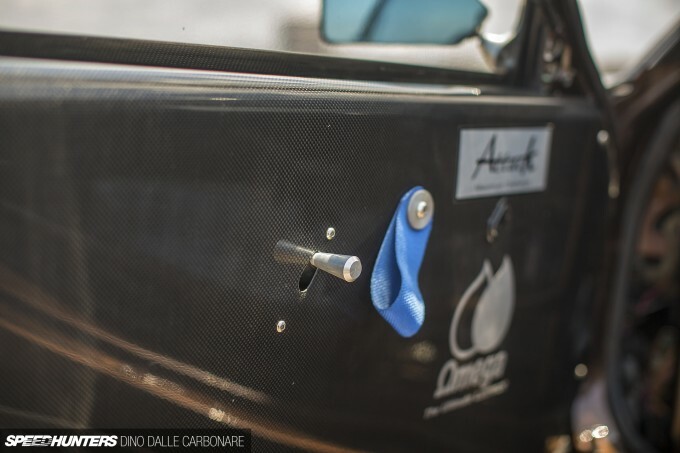 Will a set of aftermarket brake improve the lap record? Killer shots! 7 Day!!!! I honestly can't wait for the coverage! rally2727 Possibly, but if you aren't currently maxing out the stock setup, why would you need to get larger and possibly heavier brakes? Can't wait to see the coverage of the 7 Day. Herblenny You'll enjoy the story on RPS Motor Sport I have coming tomorrow then. Parts hoarding to another level!! speedhunters_dino Herblenny Thanks for bringing back the 7's day coverage. Herblenny, have you gotten your three rotor running yet ? Probably great fun to drive, but the looks....dogs breakfast and a half. The finish of those CF parts on the quarter and bonnet...geez. Looks like they were attached by a blind person! Nothing lines up...so much for high quality! Wallpapers, Wallpapers everywhere!!! And an amazing article as well!!! designs belonging to same company. Its attractive look have won my heart. Amazing…..! Can't wait to read it Dino. I have everything now and started to put things together. But recently busy with Defi smart adapter stuff so that took my free time past month. I'm about to tear the 20b apart and make it a long block this month. D1RGE @Fiatdude @speedhunters_dino rally2727 That was I'm expecting, at least a 4-pot behind the ZE40 sets. Still surprised about the fact they're running on 500+ horsepower with stock brakes. @Fiatdude rally2727 You got 400 horsepower and probably some drag in that Karmann, at least more drag than this particular RX7 (judging from the exterior from both cars). What amazes me is the fact that they run 500+ with stock brakes. Nice GT2 wheels (if I'm correct) you have there. D1RGE speedhunters_dino rally2727 And they still manage to do 56s on the Tsukuba! @http://www.livefyre.com/profile/4045053/ That opening photo is so spot on. You continue to create such great work, I admire your passion. Hope all is well! So many picture downloads! Great little FD! But Dino we need more Evo content! This is a great article, and I love reading full build stories like this. Good job! I have had the first picture in the article (in front of the Tsukuba paddock) as a background forever. So glad you featured this speedhunters_dino! speedhunters_dino How can we get some of those awesome shirts? 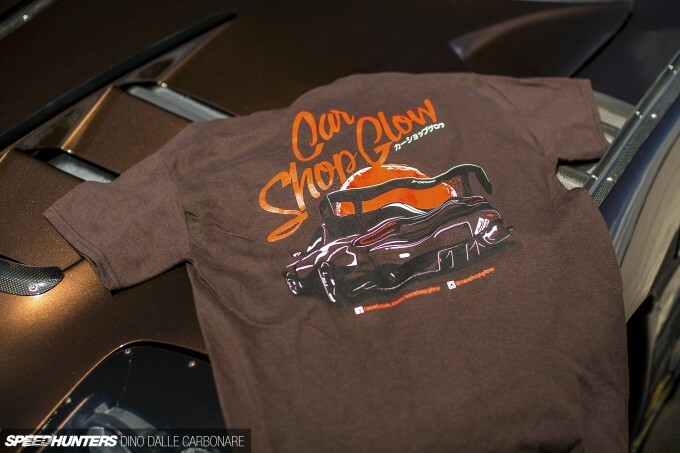 Seriously cool car, I'd love to walk around nowhere Ky repping Car Shop Glow! Great coverage and beautiful photography as always. This, to me, is what a modified car should be - visually and obviously different from its original form. You can tell that there's an FD under all those new panels, but the vehicle looks above and beyond its stock form. There has to be a reason for it so I'll ask. In F1 they shorten the exhaust to blow the exhaust gases onto the rear diffuser, for a little extra downforce. Here the exhaust is extended past the diffuser. Why the difference? Don't want the heat staying under there burning stuff? 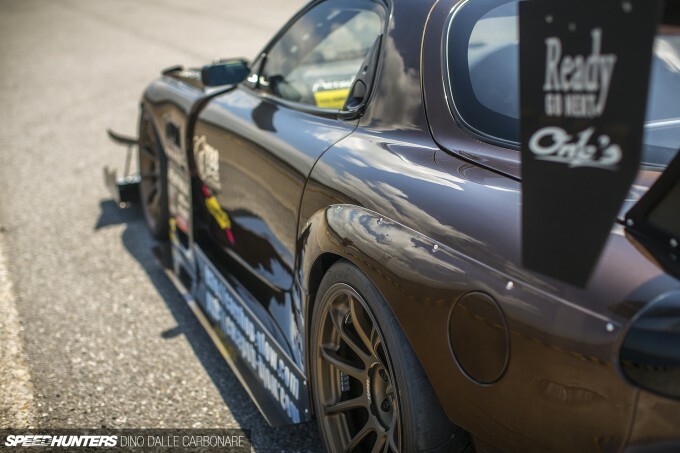 speedhunters_dino tunerguy21 Since you mentioned it. Will any of you be covering Gatebil next weekend? LukeEVOVIII Actually yeah, I miss Suzy for that very reason. Having said that, Speedhunters missed 7's day coverage last year so I'm super excited for this year. speedhunters_dino MAXIMUMatttack Speaking of trucks, any chance you might be swinging by Flex Dream any time soon? petertarach Thanks Peter! Hope all is well with you too my friend! rally2727 D1RGE speedhunters_dino Yep that's the craziest thing of them all! Just wondering something about this setup. He's running a hks fcon with an apexi power fc commander? Is this actually possible? AndrewBatek I've given up trying to understand Japanese style engine management systems a long time ago. The best way I can describe it all would be that they are akin to a Christmas tree, running lots of "decorations" off a main tree and its branches. Maybe the PFC was used before and the commander remained? speedhunters_dino AndrewBatek Only thing is the power fc commander uses what looks like an s-video cable (minus one pin you actually break off.. I know because i have one in my fc).the power fc commander hooks into the power fc and displays data and allows changes to be made to the mapping (not full control like using a datalogit but works for minute changes). Was just curious if someone figured a way to hook it up to a fcon. 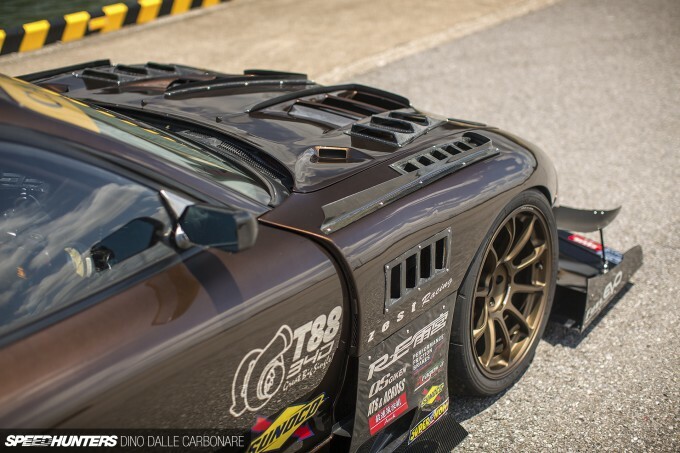 Hey speedhunters_dino if time attack is not popular in Japan then what is? Super GT and drift? I suppose "time attack" is the same thing as "gymkhana" or "autocross", depending on which part of the world you're from? speedhunters_dino Smiggins, cars are now more or less made to look sporty, with low profile tyres and 17"s or bigger. Lots of bodykit, with new engines that are more advanced than those of stock sports cars from the 90s and late 80s. I'm going to turbocharge mine later on, just to keep up. Love the additional rotary content. I do have one question though. In your travels, have you spotted any quality NA rotary builds (excluding three and four rotor)? It seems there is a lack of coverage or builds. John Key NZ speedhunters_dino No it isn't, timme attack is hot lapping around a race track, not around a custom layout with cones and stuff.